Lime-Soil stabilization is the process of adding lime to the soil to improve its properties like density, bearing capacity etc. Various factors affecting lime-soil stabilization are soil type, lime type, lime content used, compaction, curing period and additives which are briefly discussed below. The principle involved in lime-soil stabilization is the exchange of ions between lime and soil when added.When clayey soil is treated with lime, Cation exchange takes place between them which increases plastic limit and reduces plasticity index which finally results in increase in stability of soil. If clay contains gravel in it, then lime acts as binding material for clayey gravel. 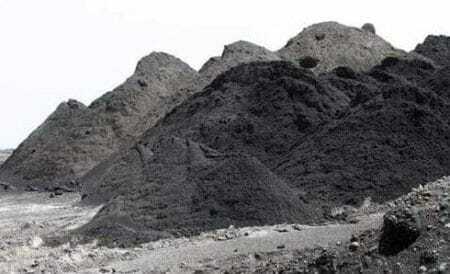 Lime-Soil stabilized mix are useful to construct sub-base and base course for pavement. Lime treated soil is more suitable for warm regions where temperature is very high and for colder regions it is not suitable. 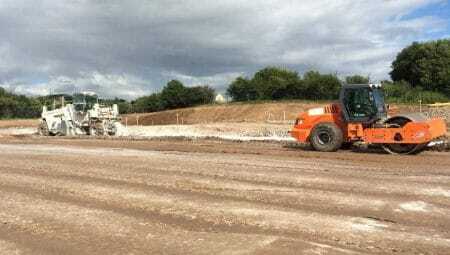 lime soil stabilization is suitable for soils like clay, silty clay, clayey gravel etc. and is not suitable for granular soil or sandy soil. The method of mixing lime into soil for stabilization contains following steps. The soil which needs stabilization is scarified and pulverized by suitable equipment. 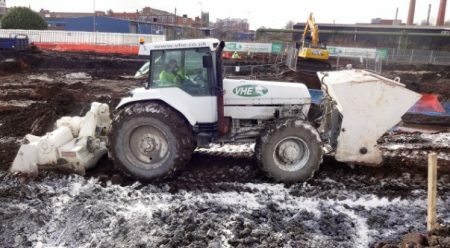 Now add some amount of lime to the pulverized soil either in powder form or in the form of slurry and mix using suitable equipment. In general slurry is recommend for better mixing. 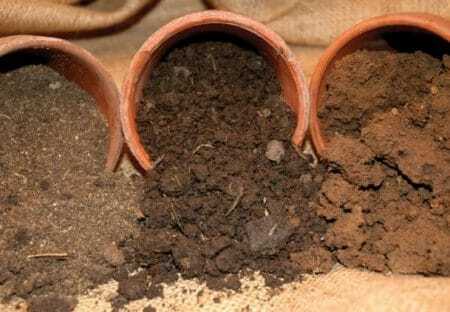 If lime powder is used, water should be sprayed allover the soil. Leave this mixture for 1 to 4 days since, lime-soil reaction is slow process and needs some time. After that, add rest of the lime content and mix it for the final time. Spread the soil to required grade and compact it using rollers. compaction should get required maximum dry density. The compacted lime-soil layer is allowed for moist curing for 1 week. Field tests are conducted to check water content and maximum dry density of compacted soil. The type of soil used in stabilization should be of reactive type soil. Which means the soil should react with lime content when added. To reacts with lime, the soil should contain pozzolan content in good amount. 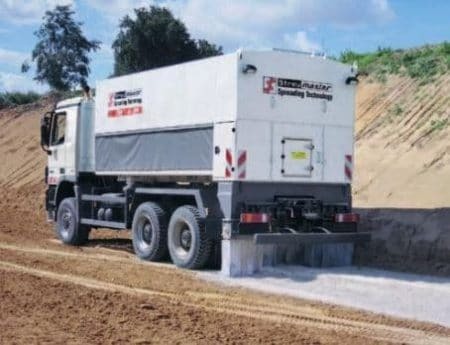 When lime is added to pozzolanic soil in presence of water, calcium hydroxide from lime reacts with siliceous and aluminous materials of soil and form a mix with cementitious properties. This reaction is called pozzolanic reaction. This reaction will increase the strength of lime-soil mix and strength gain is gradually increased with age since pozzolanic reaction continues for very longer periods. Quicklime (CaO) is more effective than hydraulic lime (Ca(OH)2) but however, there is only slight difference in the final results. If Quick lime is using, care should be taken by workmen otherwise skin burns etc. may occur. So, in most of the cases hydraulic lime is used either in dry powder form or by mixing water. When lime content is added to soil in presence of water, plastic limit increases thereby plasticity index decreases. 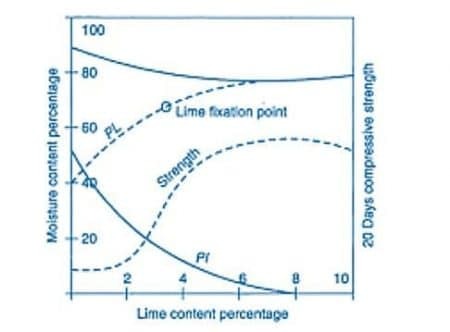 When lime content is added further, after certain point the plastic limit starts decreasing. This point is termed as lime fixation point. To obtain desirable stability, plasticity index should be very low or zero which means make the clay or soil as non-plastic material. Adding proper quantity of lime also increases shrinkage limit. Swelling can also be minimized by increasing lime content in the soil. To obtain greater strength of lime-soil mix, density of mix should be greater. Lime-Soil mix should be compacted at optimum moisture content (OMC), at which soil gets maximum compacted density. Curing is also an important factor in achieving good stabilized lime-soil mix. Proper curing must be provided for the mix especially during initial stages where rate of strength gain is rapid. But this strength gain is dependent of temperature of that area, for low temperature regions rate of strength gain is very less. For freezing zones it is almost zero. Humidity also effects curing and rate of strength gain of lime-soil mix. 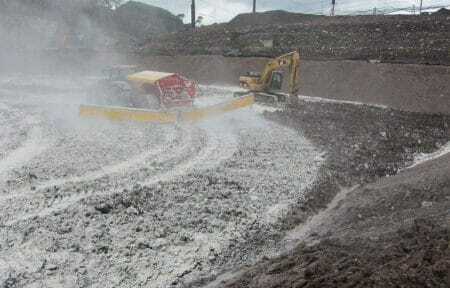 Additives are the materials which are added to improve lime-soil mix to improve its strength. 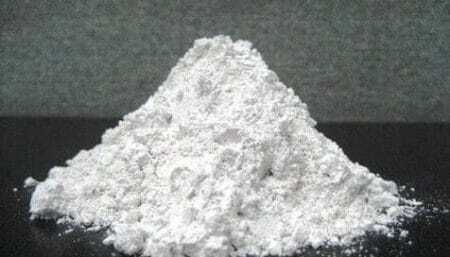 Some additives generally used are Portland cement, fly ash, surkhi etc. If fly ash is available as a waste product, then it is most recommended additive since it gives desirable strength at economical rates. Chemical additives like sodium metasilicate, sodium sulphate, sodium hydroxide etc. are also available. Suitable chemical additive for lime-soil stabilization among the following? Which of the following factor affects the lime-soil stabilization?